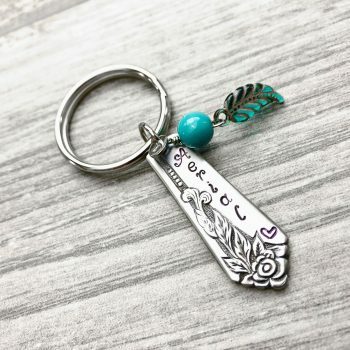 Hand stamped ‘I Hope You Dance’ zipper pull / bag tag circlet detailed with a central mandala sunburst and dandelion (with puffs). Garnished with a beautiful deep purple Swarovski crystal and secured to a heavy duty swivel lobster claw clasp. Solid, sturdy and unique this pretty zipper pull is perfect for your coat, keychain or dance/gym bag. Circlet measures 1 1/4 inch plus swivel lobster claw clasp.